Guilds began growing in Europe around the 10th century when individuals began to move into towns. In towns, merchants were able to band together for protection and eventually establish formal rules and conventions for conduct and membership. 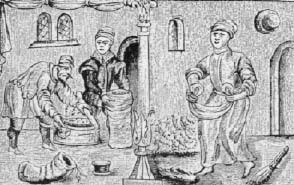 By the 13th century, guilds were amongst the most powerful groups in Europe, and organized the performances of the miracle cycles that were so important in the development of drama in Europe. Nevertheless, by Shakespeare's day, the Guild system had begun to decline. The Renaissance and Reformation periods opened up new markets, allowing merchants to establish companies which often pushed guilds out of business. Individuals who would previously have been guild Masters became business owners, and their Journeyman and Apprentices became paid laborers. Strong governments also served to check the once vast influence of guilds. Elizabeth's parliament, for example, in the Act of 5 Elizabeth, c.14, stipulated that there were only to be three apprentices for every journeyman, that a minimum of seven years of apprenticeship was required, that apprentices, when bound, must be less than 21 years of age, and that foreign workers were not able to become apprentices in England. These and other rules helped curtail the exploitation of apprentices as cheep labor, but it also caused many guilds to disappear, some to amalgamate, and others to become more like modern businesses.